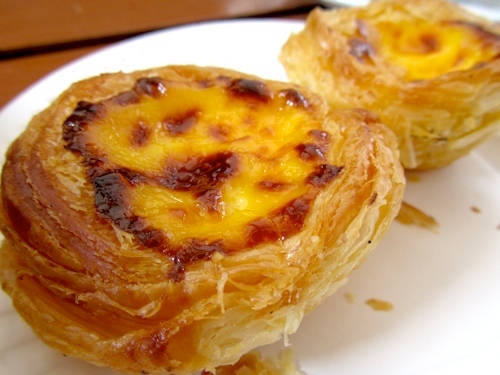 Anyone who has either been to Macau, lives there, or have heard about this ex-Portuguese colony would know that Portuguese egg tarts are Macau's most famous and popular snack. It is said that the Hong Kong-style egg tart (aka dan tat) - our favourite sweet dim sum - evolved from the Portuguese egg tarts, brought to HK from Macau. 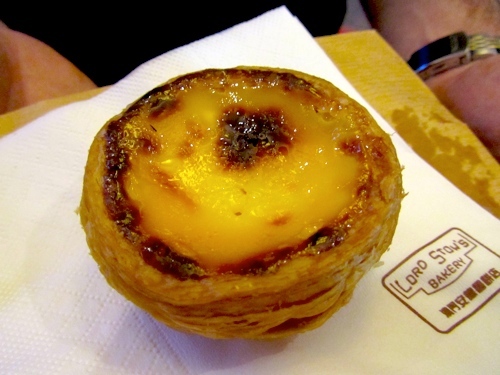 The egg tarts in Macau are quite different from the ones in HK (and apparently, even in Portugal itself), but we found it difficult not to draw comparisons with the egg tarts familiar to us. 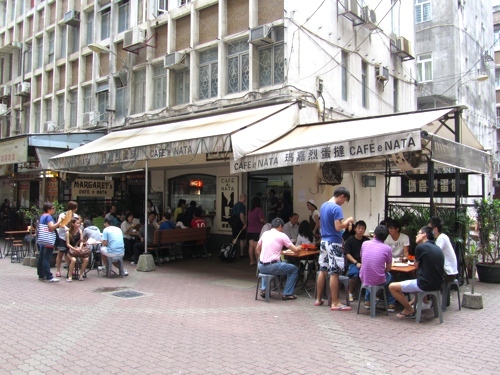 Egg tarts are quite easily available from bakeries and restaurants across Macau, but the two most well-known ones are from Lord Stow's Bakery and Margaret's Café e Nata. Lord Stow's is the most famous of the two by far, claiming fame in international waters in Japan, Korea and the Philippines. 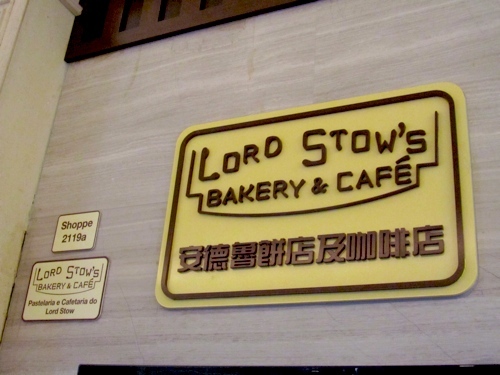 There are a number of Lord Stow's franchises around Macau, including at The Venetian where we watched a Cirque du Soleil performance, so it was relatively easy access to their egg tarts. There is only one Margaret's Café e Nata, and I read somewhere that the owner, Margaret, is the ex-wife of the creator of Lord Stow's. 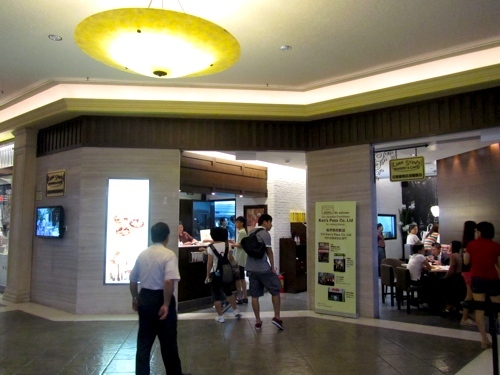 Both bakeries have their own following and fans, and one of our objectives during our weekend in Macau was to find out which egg tart we liked better. Since we were at The Venetian for a show on our arrival day, we took the opportunity after the show to grab a couple of hot egg tarts at Lord Stow's. Each tart cost around MOP$8, which is pricier than the egg tarts we can get at bakeries in HK. I guess they are milking all they can from their name. The egg tarts were delicious with smooth custard filling and flaky pastry. The custard was a bit sweeter than the HK versions, and I could tell from the pastry texture that lard was an ingredient (not necessarily a bad thing if not consumed in excess). The next morning after we checked out, we made our way into Macau's centre and dropped by Margaret's Café prior to doing some sight-seeing. It's a small, no-frills coffee shop (of more questionable hygiene standard than at Lord Stow's) located in a back alley just a little away from a major street. It didn't take us long to locate it, and the tables were already full at 10am in the morning (and I heard it gets much more crowded in the afternoon). 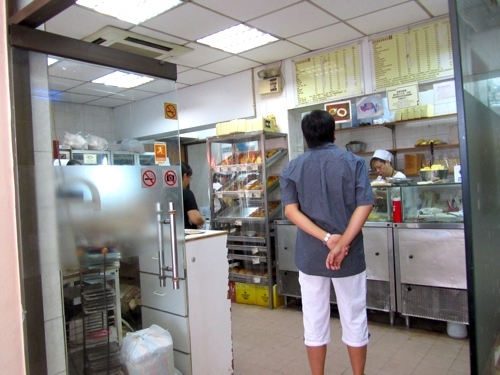 Margaret doesn't just sell egg tarts - there are also sandwiches, pies and other baked goods for a substantial snack or meal. Don't expect to be treated cordially here, and I reckon if this was any other coffee shop, the surly service would surely be enough to turn customers away. 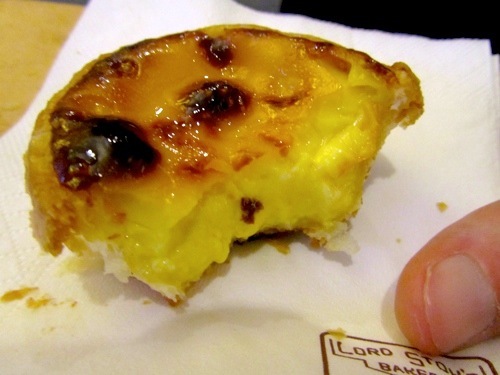 The egg tart was served piping hot with pastry that flaked even more than the ones at Lord Stow's. The custard filling was not too different from Lord Stow's, however the pastry was very greasy and too buttery even for hubby (and this man loves his butter!). I think it's quite obvious that Lord Stow's egg tarts win over Margaret's. If we had to choose between these Portuguese-style egg tarts and the Hong Kong egg tarts, we still do prefer HK egg tarts. Both lard and butter are not very healthy, so it's not advisable to eat egg tarts in excess! I still prefer Macau tarts over Hong Kong egg tarts.